Dover Corporation (DOV) is a diversified manufacturer of a broad range of specialized industrial products and manufacturing equipment. The company has grown largely through acquisitions. It has four operating segments: Industrial Products (32% revenue 2009), Engineered Systems (28%), Fluid Management (22%), and Electronic Technologies (18%). DOV's growth strategy is based on initiatives such as (1) driving organic growth which includes new products, pricing initiatives, gaining market share, customer service; (2) acquisition strategy which includes acquiring and developing platform businesses, growth, innovation, higher-than-average profit margins; (3) expanding globally, and improving operating efficiency. DOV is a Dividend Aristocrat and member of Broad Dividend Achiever and has been raising dividends for last 56 years. The most recent dividend increase was in August 2009. 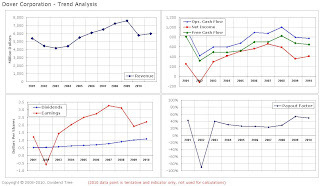 It remains to be seen if dividend increases in August 2010. My objective here is to analyze if DOV still continues to be a good dividend growth stock and whether it is priced to add more. 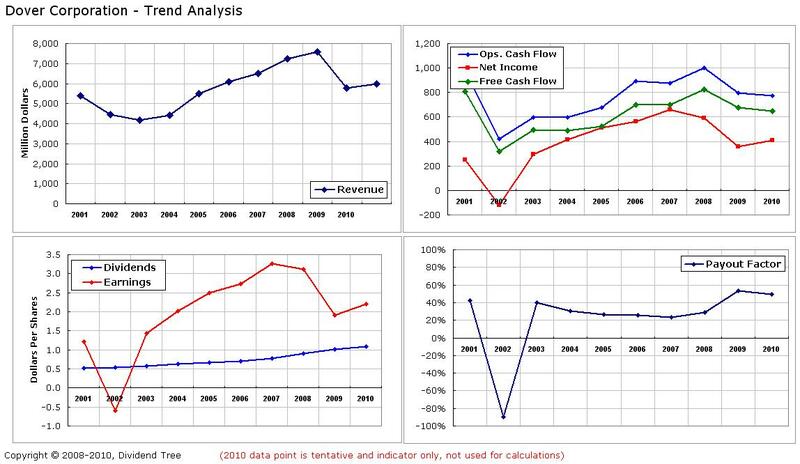 Revenue: As expected, significant drop in 2009. The average revenue growth for last 10 years has been approximately 6.8%. The drop in 2009 skews the growth rate. Cash Flows: Overall, a slow increasing trend of free cash flow and operating cash flow. It is good indicator that FCF is always greater than income. EPS from continuing operation: Significant drop in 2009. Very erratic growth. Here I use the corporation’s financial health to assign a risk number for measuring risk-to-dividends. The risk number for risk-to-dividends is 1.86. This is a medium risk category as per my 3-point risk scale. The negative EPS growth, higher payout ratio, and current high price makes it a medium risk to dividends stocks. A lower payout ratio can make shares a low risk. Quality of Dividends This section measures the dividend growth rate, duration of growth, consistency over a period of past five years. Dividend growth rate: The average dividend growth of 8.5% (stdev. 4%) is almost similar to average EPS growth rate of 9%. Dividends are more or less growing along with the earnings. Duration of dividend growth: 56 years. Payout factor: It has reached close to 50% in last two years. Dividend cash flow vs. income from MMA: Here, I analyze how the dividend cash flow stacks up against the income from FDIC insured money market account. The baseline assumption is (a) stock is yielding 2.3% at current price of $44; and (b) MMA yield is 1.8%. Last 10 years average dividend growth rate has been 8.5%, however, my projected dividend growth rate is 6.8%. With my projected dividend growth of 6.8%, the dividend cash flow is twice the MMA income in 10 years time period. Graham number: $20 The range of fair value is calculated as $25 to $31. Dover Corporation founded in 1947, based out of New York, and has been paying and growing dividends since last 56 years. What surprised me is Dover’s ability continuously grow and sustain itself with so many different acquisitions and divestitures. This demonstrates that it keeps adapting to changes in the market place. Its revenue is pretty diversified in different product sectors and global regions. 43% of its revenue comes from outside of North America. Its four product lines have share of 32%, 28%, 22%, and 18% respectively. It continues to have stable gross and operating margins, generates relatively consistent operating cash flows and free cash flows. It has had a short blip in 2008 and 2009 which skewed its 10 year historical matrices. While early 2010 results show recovery, it remains to be seen how far the recovery is gone and whether it will be sustainable. I like DOV diversified revenue stream and geographical presence. Overall, it is a US based company that will provide hedge against dollar fluctuation and proxy for foreign developed/emerging markets. It has been raising dividends for last 56 years. The stock’s current risk-to-dividend rating is 1.86 (medium risk). This risk increased due to negative EPS growth in 2009 and increase in payout ratio. In addition, the current pricing of $44 is way above by buy range. While I would continue to hold my existing position, I will not be adding any new share lots until EPS grows and payout ratio reduces to its own historical average. Full Disclosure: Long on DOV.